Last week I had the distinct pleasure of presenting at the yearly conference for the consortium of American international liberal arts institutions, also known as AMICAL. This was far an away the most diverse conference I have ever been to. There were folks from Pakistan, Lebanon, Iraq, Kuwait, Morocco, Egypt, Afghanistan, Central Asian, Ghana, and various European countries. They ranged from large, relatively well-funded universities of 8,000+ students, to small colleges of less than 500. What’s more, they faced varying challenges. For example, the folks from the schools in Afghanistan, Iraq, and Ghana noted that even beyond the internet, consistent electricity was an ongoing issue. That’s a humbling realization when you’re preaching the gospel of the web. The talk was introduced by Maha Bali—someone whose intensity and commitment to the work she does is infectious. I’ve been following her online journey for more than two years now, and to finally meet her in person was a real honor. 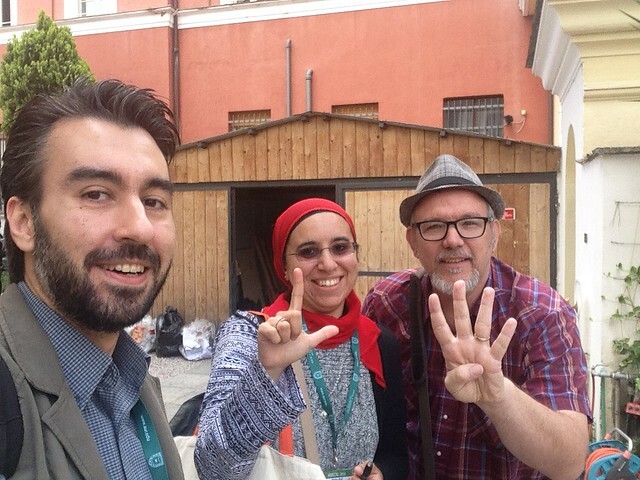 What’s more, I finally got to meet #ds106 #4lifer Dimitris Tzouris, and he was a non-stop joke machine—I loved it. Meeting the people in physical space that you laugh and learn with online is always a blast. Image credit: AMICAL Consortium featuring Dimitris Tzouris, Maha Bali, and the bava. But I hope to talk more about the AMICAL experience in another post, for now let me provide a bit of context for the talk. This was my third talk in roughly a month, and it’s gonna be interesting cause I will be blogging them from last to first. I started at OER16 in mid April, then presented at the DMLL Expo at Coventry University near the end of April, and finished up at AMICAL last week. There is an arc to these presentations, or rather a learning curve. I was planning on going into OER16 talking about containers, APIs, and open infrastructure, I did some of that—but as it turns out I spent most of the talk talking ds106. 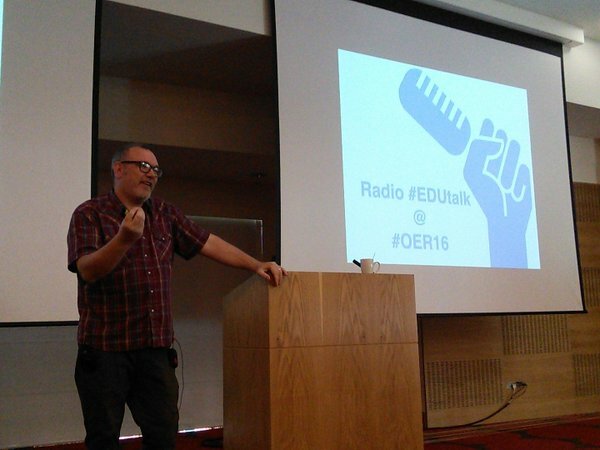 Brian Lamb joked I was “playing the hits,” and to a degree that was true, but at the same time I felt strangely obligated, but more on that in the OER16 post. In Coventry I had a brainstorm moment the day of my talk, in part inspired by the atmosphere and energy of Coventry. I scrapped my planned talk all together and gave the talk on something totally fresh: the UMW Console. I worked on that project last year with Zach Whalen but had yet to present about it, so I took the opportunity to do just that at Coventry. Which brings me to AMICAL, and the presentation in the video above. 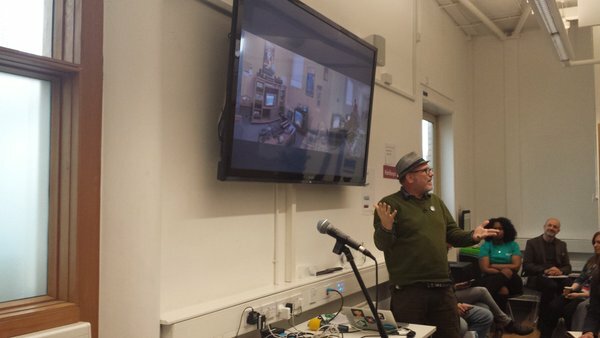 I opened this talk by grounding the idea of ed-tech as a perspective and interrogation of a moment in time, in this case a living room from 1985. I spent the first 10 minutes of the talk tracing trough blog posts I wrote last year which frame the experience of creating the exhibit that tried to re-create a 1985 living room as a lived, media experience. The cool thing about this exhibit for AMICAL is that it could be done on the cheap. Creating a lived media experience from the recent past can be cheap and quite community focused: have folks donate pieces, rummage for others, and spend countless hours on Ebay. The downside may have been the focus of the exhibit was so expressly based on my experience of American pop culture that some of the references may have been too far afield. From there I moved back to a discussion of how small is beautiful in terms of IT, experimentation, community, open infrastructure, and individual empowerment. I ended on the note that rather than big companies and governments archiving the web, it’s often small, renegade outfits like Archive Team that have preserved 15 years of Geocities sites before they were deleted by Yahoo! The individual web archivist, the marginal group of distributed “hobbyists,” the small nodes of people that make the web great are the one’s that empower it’s possibilities and fuel the long revolution. The obsession over massive numbers and big data is the opposite of the generative web that builds communities and creates relationships. 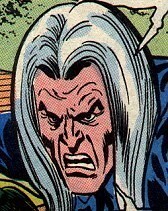 And to end the talk I returned to my origins on the web: Planet Miles. 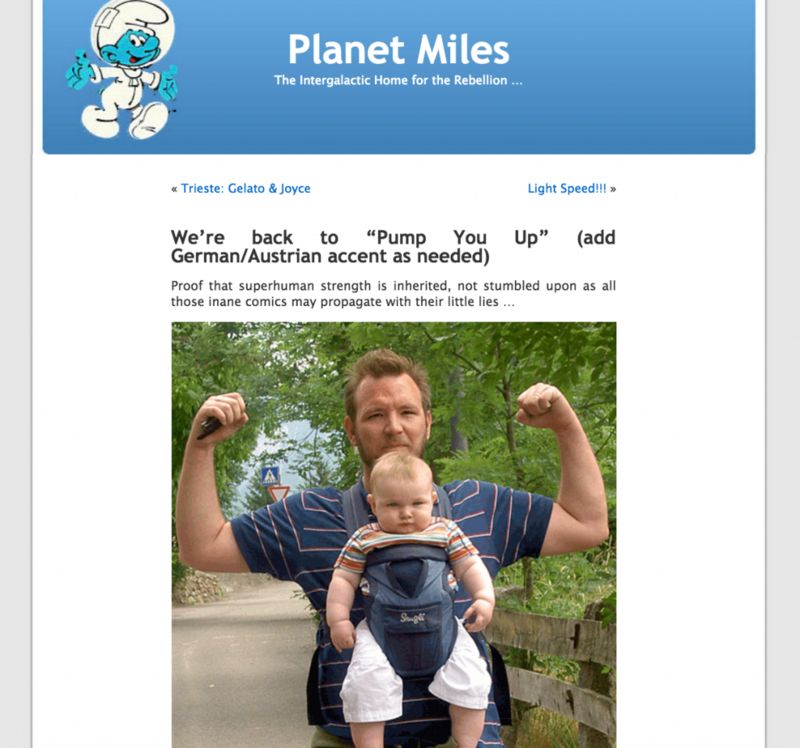 The night before I gave this presentation I decided to forego any more prep and actually spend 2 hours resurrecting Planet Miles, the first blog I created with WordPress in early 2005 to chronicle the interstellar travel of my newborn son for Antonella’s family in Italy. The site had been archived for years given some DNS issues I was too lazy to dig into, but after talking about taking ownership of one’s own piece of the web, I thought it my duty to release Planet Miles from its suspended state of slumber. If nothing else, this talk pushed me to actually bring life back to my past. it’s like Alan Levine blogged about recently, this site isn’t about nostalgia, it’s about my life. Pretty much everything I’ve done in this space over the last ten years has been in one way or another a way of documenting my personal and professional life—and I’m not dead yet. 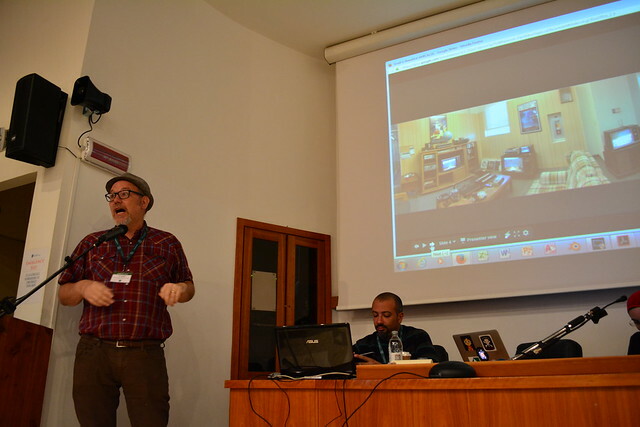 This entry was posted in presentations, Uncategorized and tagged amical16, amicalnet, Dimitris Tzouris, Maha Bali, presentations, umwconsole. Bookmark the permalink. I love the picture of Superhero Bava and his trusty sidekick….who looks a little bit cynical. Keep to your path @jimgroom. Heart, being true to self, and care about others out ranks everything else. You nail it. seeing the pic of you, Dmitri & Maha made me smile…but then the pic of little Miles and little you! iconic, man. cool that you brought the site back to life. i value my old trails being out there. this reminds me that they need a bit of attention.